Mt. Everest is famous not only for its proximity to the world's highest mountain (8848 m) and to safeguard the unique natural landscape of the surrounding Himalayan peaks but also for its Sherpa villages and Buddhist monasteries. 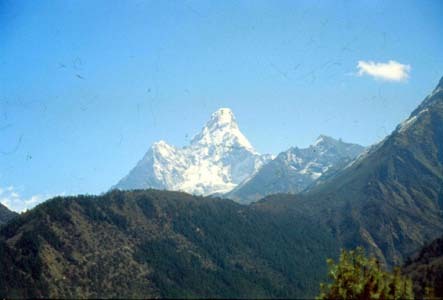 Sagarmatha National park, with an area of 1,148 sq.km, is located in this region. This region is homeland of the rich flora and fauna due to the topographical variation and protected by Sagarmatha National Park also listed world heritage site by UNESCO. This region contains 3% forest, 28% grazing land, and 69% barren land above tree line. The dominant vegetation at the lower elevation of the region below 3,000 meter is composed mostly of the Blue pine and hemlock forest. The best season to view the Himalayan peaks are in spring and autumn seasons. During the spring season from March till May, the temperature gets warmer during day and night. It is also the best season to see varieties of rhododendron flowers in bloom. The number of endangered species found in the region includes musk deer, Himalayan black bear, wolf, and goral and the Himalayan Tahrs are most common wildlife seen throughout the region. The musk deer is also commonly seen in the mixed fir, rhododendron and birch forest. Besides Mt. Everest (8,848 m), this region includes other popular peaks like Lhotse, Lhotsar, Gokyo, Mera, Island, Amadamlam, Makalu, Cho-Oyu, Nuptse, Pumori, Taboche etc. This region covers the upper catchments of Bhote Koshi, Dudh Kosi and Imja Khola Rivers and form one of the headwaters of the Ganges River. 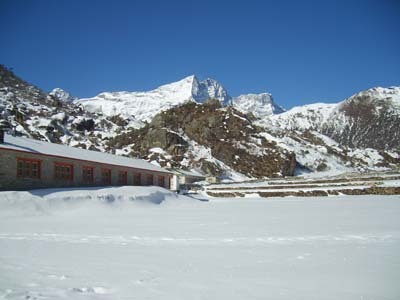 This region is very much popular among the mountaineers and adventure trekkers. The combination of the natural beauty of the surrounding mountain peaks and the local Sherpa culture makes this region popular tourist destination of Nepal. Day 01: Arrival in Kathmandu. Transfer to Bhaktapur. Welcome Dinner. Day 02: Fly Kathmanu to Lukla (.860m).Trek to Phakding (2.610m) 4Hrs. Day 03: Trek to Namche Bazar (3450m) 6Hrs. Day 04: Acclimatize day in Namche Bazar. Day 05: Trek to Tengboche(3860m). 5/ 6Hrs. Day 06: Trek to Dingboche (4350m). 6 Hrs. Day 07: Acclimatize Day in Dingboche. Day 08: Trek to Lobuche (4930m). 6 Hrs. Day 10: Excursion to Kalapatthar (5645m). Trek back to Pheriche (4.250m). 7Hrs. Day 12: Trek via Namche Bazar to Jorsalle (2860m). 7Hrs. Day 13: Trek to Lukla (2840m). 5 Hrs. Day 14: Fly to Kathmandu. Transfer to Hotel in Kathmandu. Day 15: Sightseeing of Kathmandu, Pashupatinath and Bouddha. Farewell dinner. Day 16: Free day. Transfer to Airport. 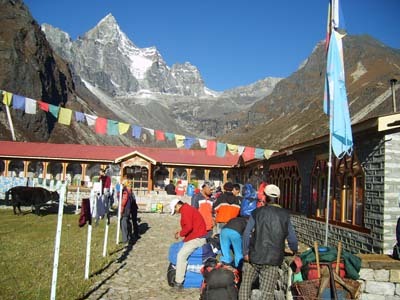 Departure date and itinerary arrangements can be tailored to your requirement, Tour cost will be Up down as per your service requirement, so please contact us for your queries regarding your Everest Base Camp Trekking Departure Date, Tour cost, itinerary, Service requirement and other any queries regarding your holiday in Nepal, Tibet, India and Bhutan. Upon arrival at international airport meet assist and transfer to the Hotel (star category, very nice and centrally located at Thamel), take rest and free at afternoon. Early in the morning fly Kathmandu to Lukla (30 to 40 min) then final preparations for the trekking. From Lukla you'll pass Chaurikharka village and make a descent towards the Ghat (2,530m). The trail follows the bank of the Dudhkosi River. To assist acclimatization, this first day Treks is 3 to 4 hrs short distance. But if people are still interested to do more activities they will have an opportunity to do the side trip to monastery around in Phakding. And overnight at Lodge. The trail follows the Dodh Kosi River banks and reaches in Tok Tok. You can see excellent views of Thamserku peak from here. 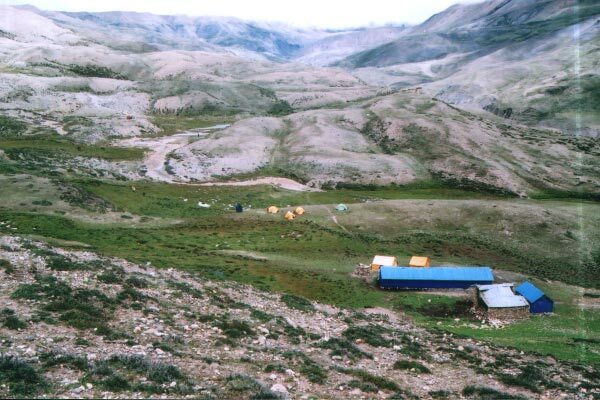 Then trail climbs to Chomoa, site of an agricultural project farm, still trail climbs to Monju (2,840m) and enters the Sagarmatha National Park Area (1,148 sq km, established in 1976). Walking some distance up you will be at Jorsale (2830m) and after cross last (fifth number) bridge the trail again long climb on where you have the view of Mt. Everest, over the right Nupste (7,879m). After 5 to 6 hrs walking the trail reaches the street of Namche Bazaar at last. Stay overnight in Namche Bazaar overseers’ snow capped Mountains and Sherpa heritage. After having late breakfast walk for the sightseeing around Namche Bazaar then hike to the Everest View Hotel. The ideal place to overview some of the outstanding mountains such as Mt.Everest, Nupste, Ama Dablam, Kangtegha, Thamserku, kusum khangru, khongde and Khumbi yu La etc. While seeing spectacular view of mountains trail led you in khumjung valley, where can see Hillary School, ancient Monastery with Yeti skull and khunde Hospital, and then return back to Namche. If you have still willing to visit you can go mountaineering museum and visit the Sagarmatha Pollution Control Committee (SPCC) in Namche Bazaar you can spend some time interacting with the fun-loving Sherpa and Rai people in here. Above the police check post you will see Sagarmatha National Park headquarters and visitor center; it is open 8 am to 4 pm except Saturdays and government holidays. And overnight at Lodge. After breakfast we start our trek with pleasant walk trail through the forest with magnificent view of mountains until Kenjoma, where the trail joins from Khumjung. After pass the small settlement Sanasa the trail drops towards Phunki Thanga (3,250m). 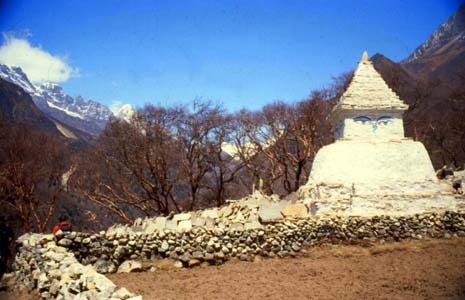 Then it climbs steeply through forests on the Tangbuche monestary sits at 3,867m. The view from here is rightly deemed to be one of the worlds magnificent; Kwangde, Tawachee, Everest, Nuptse, Lhotse Ama Dablam, Kantega and Thamserku provide a stimulating panorama of Himalayan view. Stay overnight in Tengboche. After breakfast, trail descends down from Tengboche, through the rhododendron forest to Deboche and crossing a bridge over the raging Imja Khol River. The trail for Dingbuche follows the climbing route of Island peak and Phokalde peak etc. It is gateway to Chukung and farther beyond for the most challenging traverses towards Makalu area and Hinko Valley via Sherpani col (6,100m) and Amphu Laptsa pass( 5,780m) trips. On this day you may have full day rest or there are some places where you can go for a day hike; up to Chhukung(4,730m) for acclimatization (point of climbing famous Island peak) or climb up to Nagarjun Peak about two hours offer view of Imjatse Valley with Dingbuche village and Mt.Makalu(8,463m), Ama Dablam, Island peak etc. And back to Dingboche for overnight. After your complete acclimatization, the trail heading you gradually climb up until Duglha offering stunning views of Tawachee and Cholatse.From Duglha trail directly up to the Khumbu Glacier for an hour, then left into the memorial area before reaching the village of Lubuche. In this stage the effects of the altitude will be kicking in and you can expect colder nights. After breakfast the trek continues gently climb and sometime direct ascent to nearby glacier. The trail goes to Gorakshep is rocky and windy but it offers the good view of Mt. 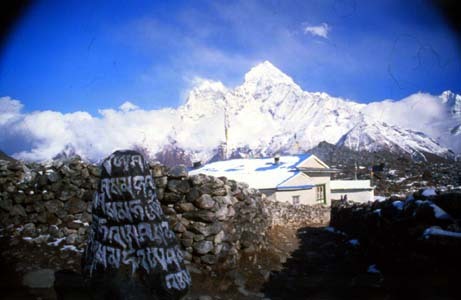 Pumori and there are beautiful views of the Everest Base camp and glacier with scenic view. After lunch, we ready for our adventure to the targeted destination and we continues our trek towards the Everest Base Camp and to the Khumbu Ice-fall, the path from here can be misleading, follow the lead Sherpa, every year the trail changes due to the movements of the glacier, the walk is quite strenuous due to the high altitude and thin air, the walk passes through over rocky dunes and moraine and streams, till you reach the base camp. If you are during the high expedition season have fell like city. It takes 2-3 hrs to get to base camp and after a grand time here go back over the journey to Gorekshep for the overnight at lodge. Very in morning climb up 2 hour on our pace Kalapater for 360 degree view of the mountain peaks. When reaching the top, you will feel joyful as you achieve the moment that you been dreaming, since the planning of your journey. A small rocky peak “Kalapater” offer you beyond imagination as the Everest looks amazing, the panoramic view from this spot is something to cherish, and you feel it’s worth the hard climb up to here and to feel at the top of the world, and can be seen to the south Khumbu glacier sweeps below you, and you can also see the Everest Base camp down below on the moraine of Khumbu glacier and many mountains scenery; Pumari (7,145m), Lingtren (6,695m), Khumbutse (6,623m), Changtse (7,550m), Nupse (7879m), Everest itself etc. After breakfast in Gorakshep trek down to Dhugla then go staying high above the valley floor Pheriche, in Imja valley. It is the only place in Khumbu where barley is grown in the highest place; enjoy the scenery and overnight to hotel. Today you can fell easer heading downhill to a lower elevation from Pheriche the walk is pleasant all the way to Tyangboche. You can see very old pangboche Sherpa village, and further down to Tyangboche is one of the most beautiful place in the Himalaya the first thing that comes to your eye is the big Monastery or Gumba, then the large field with campsites and teahouses, lodges beneath the soaring majestic gorgeous peak Ama Dablam, Everest, Mt. Lhotse and Lhotse Shar towards north east and more peaks all around. After breakfast the trail goes down through forest with pine, Jupiter, rhododendron and some few magnolia and birch trees with a great memory after crossing the suspension bridge over the Dudh Koshi River trek onwards to the Sanasa and re-tracks to Namche bazzar for stay overnight. After a long walk we'll have long last day trek back to Lukla today, we descend the long way before cross the bridge and further walk to Monju and stop in Phakding for lunch. We will remind again enjoying the lush green scenery around and passing through the incredible mountain scenery and local Sherpa village until Lukla. You'll have time to wander around the areas and guide will re-confirm your flight ticket and enjoy the last celebrate dinner with your crew and overnight at hotel. Normally, the flight for Kathmandu is morning due to the wind in afternoon; sometime the flight time can be delayed due to bad weather and other reason beyond our control. Anyway we will fly back to Kathmandu and drive to Hotel, there you relax after long journey and take back your breath and rest at your hotel rest of day. In this pleasant day, you may have full day at leisure either relax at hotel or explore the around Thamel. Today is day of ending your journey, so we would like offer you farewell dinner in Nepali typical Restaurant and hand over you Trip Certificate, Trekking Permit and TIMS Card for memory of Nepal trip. Today is free or last minute shopping for souvenirs or gift to your family, friends or relatives for you until departure flight/drive. Our assist will be transfer to the International Airport for your departure flight to your onwards destination.